The grated marzipan gives these buns a sweet, almondy nish, but they’re just as good without it. The dough is quite sticky, so use a freestanding mixer to knead it, if you have one, and leave the dough in the fridge overnight to prove if you can. If you’re not eating the buns fresh out of the oven, halve them and toast under the grill. 1. Put the dried fruit and orange juice and zest in a small pan. Warm over a low heat; set aside for the fruit to absorb the liquid. 3. Shape the dough into a ball, put in a clean bowl and cover with cling film. Leave in a warm, draught-free place for about 2 hours or until doubled in size. You can also prove the dough overnight in the fridge; bring it back to room temperature before continuing with the recipe below. 4. Add the soaked fruit and grated marzipan to the dough and knead by hand until thoroughly combined. Divide the dough into 16 even pieces – roughly 80g each – and shape into buns. Arrange the buns, smooth-side up, on 2 parchment-covered baking sheets, cover loosely with cling film and leave in a warm place for about 1 hour until the buns have doubled in size again, are well risen and springy to the touch. a freezer bag or disposable piping bag, snip off the corner to create a nozzle and pipe a neat cross on top of each bun. 6. Bake the buns on the middle shelf of the oven for about 20-25 minutes until golden. Mix the caster sugar with 1 tbsp boiling water until dissolved to make a glaze. Brush over the buns as soon as they come out of the oven. Cool slightly, then serve with slightly salted butter. For a twist on the classic, tip 40g plain flour, 40g soft light brown sugar, 25g ground almonds and 50g chilled and diced unsalted butter into a food processor. Pulse until it starts to clump together (or rub in by hand). 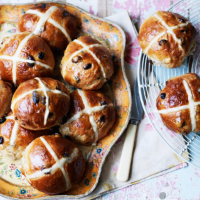 Egg-wash the buns, sprinkle over the crumble, then pipe the crosses on top. Bake as above.